Brit Nerf, the British nerf forum has just received a face lift. With a new appearance and a spring clean the forum is looking fresh. 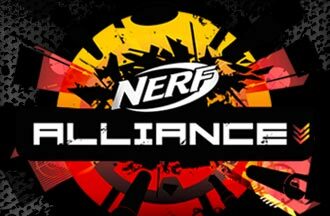 New admins and moderators (myself being one of them) will hopefully help us support the UK nerf community. Come and have a look and see if you like the changes. Brit Nerf. Thanks to BNWnerf for the new look. Argos have a really neat deal going on with their Nerf products at the moment. Basically, when you buy selected products, you get a unique code on the box. Enter this code on the 'Nerf Alliance' website and you are awarded tokens that you can save up and redeem for cool Nerf goodies. 3 Tokens - 2 packs of Vortex Lumitron discs or 36 Clip System darts. 6 Tokens - Nerf Dart Tag Speedload. 10 Tokens - Nerf Vortex Lumitron. Now, I know that you will have to spend a lot of money to get anything out of this offer. Don't automatically go for the big ticket items if you want to get some free stuff. I think the cheapest way to get anything out of the offer is to take advantage of Argos' other offers. They are currently offering two Maverick REV-6s for £15. Buy 10 of them, pay £75 and get a free Lumitron. Not the best way of doing it. Lets face it, you're going to buy new Nerf stuff anyway, why not get it from Argos and get some free stuff aswell? I think it is about time I introduced myself. Since I'm gonna be around for a while I might as well tell you a thing or two about me. Well, I'm 27, I live in London and I love Nerf. Oh! And I have a YouTube Channel showcasing every thing I do that is Nerfy. Things have been a little slow recently (what with this gorgeous British summer we're having) but there are some exciting videos on the way. Nerf N-Strike Elite Strongarm Sold! Likelyhood is that Hasbro bought it in order to stop information being leaked. Otherwise some lucky bugger with far too much money decided to throw their money at it. Either way, I like to think that the good people at Hasbro were having kittens when they found this listing. I hope the seller buys herself something nice.